If you are planning your first time in Karon Beach, it can seem like quite a limited destination. It has a fantastic (and very long) beach, lined with some first-rate hotels, but is that all there is? Well, if you take a look at our guide below, you will find that there is a lot more to see and do here. Away from the beach, Karon has an impressive array of restaurants and even a modest nightlife to enjoy while Wat Karon and its weekly market are major attractions for locals and visitors alike. Karon Beach is a good place whether you are looking for peace and quiet or a little bit of excitement. It is such a big place that it can easily accommodate both sorts of setting without one overwhelming the other. However, it also means that you need to know where to look, which is where our guide to what to do in Karon in one day comes in very handy. Karon is probably the most family-friendly part of Phuket. It has a very long beach with plenty of activities, a great choice of family resorts, nice restaurants and a modest nightlife. There are also lots of little shopping arcades, selling all of your essential holiday supplies. Those looking for a relaxing break and a good suntan certainly won’t be disappointed. The main thing to do in Karon is to hit the beach – it’s a really nice beach! One of Phuket’s longest, the sand is soft, white and squeaks when you walk on it. The sea is clear and there are no rocks or obstructions near the shore, so taking a cooling dip is easy. Other than the beach, Karon is particularly good for families, with a choice of sports and activities available and several good budget shopping areas for the grown-ups. Even if it means checking out nothing else, you should definitely see these three things to do in Karon. The dining scene is Karon contains a lot of variety. You’ll find the best options on the rocky headland at the southern end and lots of international places around the northern end. There are many seafood venues in Karon Centre, the busiest part of the otherwise quiet town. Along Beach Road, your choices go from great hotel restaurants to cheap local joints. If you have to pick a restaurant for your stay, here are three places we would recommend: One with a view, one with outstanding food and one great local Thai restaurant. Karon Beach may not seem like it’s that busy at night (especially compared to Patong Beach), but don’t be deceived! There are actually three or four parts of town which really come to life in the evenings, but they are really widely spread. As with the dining scene, the choice covers a wide range of budgets and preferences, from the swanky beach club to the extremely popular Irish bar. If this is your first time in Karon Beach, these three places should be on your list for after the sun goes down. The hotel selection in Karon leans mostly towards big resorts, including most of the big international brands. They’re also unusually family-friendly, and you’ll see Karon Beach heavily represented on our list of the best family hotels in Phuket. To help narrow down the broad choice of excellent hotels available, we strongly suggest taking a look at these three places. These are our favourites, thanks to their fantastic locations, grounds, facilities and service. 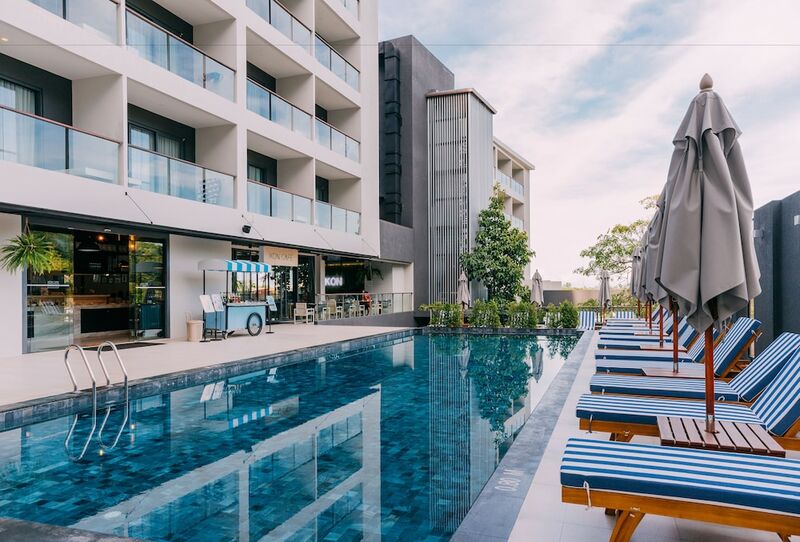 If you’re planning your first time in Karon Beach, we believe that staying in one of these places will almost guarantee a lovely stay.